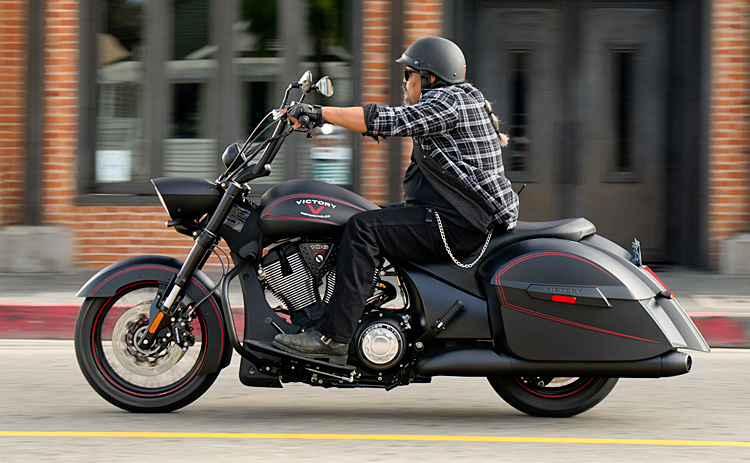 Victory is providing early introductions of four 2013 Baggers: three Cross Country models and the Hard-Ball. Dynamic styling. Triple-digit torque output. Roomy, weatherproof saddlebags. And Victory attitude. You get all of that from the 2013 Victory Bagger models – the powerful, versatile bikes for riders who take their own path rather than following the pack. 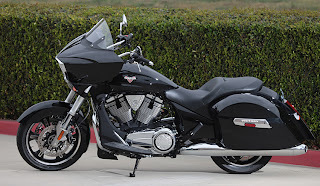 Whether a rider is heading across town or on the open road, a Victory Bagger like the 2013 Cross Country or the take-no-prisoners Hard-Ball is a great choice. The early release 2013 Cross Country models have a custom styled fairing with premium integrated audio, and large, lockable hard saddlebags. The bike’s long, flowing lines give it distinctive, ground-breaking looks only Victory could deliver. The comfortable ergonomics and powerful engine stoke the “let’s ride” attitude. 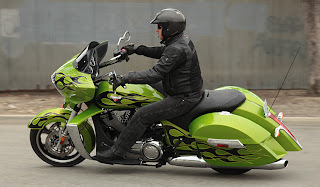 • Antifreeze Green – A custom-look model with black flames and chrome trim – including the stylish forged highway bars. • Sunset Red with blacked-out trim, black tubular highway bars and black drivetrain cases. All Victory Baggers deliver an outstanding ride and smooth easy HANDLING. Each model has a two-piece cast aluminum frame that essentially creates a spine running the length of the bike. The engine is solid-mounted to the underside of the frame as a stressed member of the chassis. This strong, solid chassis provides consistently true and predictable handling in the corners. A Cross Country or Hard-Ball rider can head into a corner at speed – even riding 2-up with cargo in the bags – and the bike will track through the turn on a line. There’s no frame flex, no waver, wobble or walk. Just smooth, easy handling from a full-sized Bagger. Plus, since the frame is above the engine, there’s no structure beneath the engine, resulting in exceptional cornering clearance. Lean, lean, and lean some more into corners. These Baggers have sporty, responsive handling that only Victory can deliver. Providing impressive POWER is the Victory Freedom® 106/6 drivetrain – a 106-ci V-Twin and 6-speed transmission with overdrive. The engine pumps out 106 ft-lb of torque in Victory Baggers, which puts a rider in full control with great confidence in any traffic situation. There’s always power on tap to make a pass as needed. A bike with an engine this powerful needs effective braking, and every Victory Bagger has premium ABS – Anti-lock Braking System. Cruise control is also standard on all Baggers. COMFORT features on every Victory Bagger include a plush 2-up touring seat and long driver floorboards so a driver can reposition feet and legs to stay comfortable during long days in the saddle. The Cross Country has a fairing that provides wind and weather protection and has an integrated audio system. AM/FM radio is standard, and accessory connections are available so a rider can pump tunes from an iPod®/MP3 player through the premium audio system. The Hard-Ball has contempt for practical, protective fairings and windshields. Don’t tell the bike they’re available as accessories. 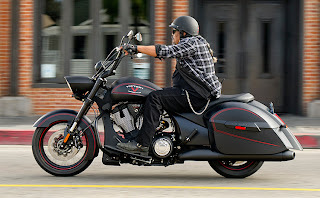 The Cross Country and Hard-Ball have large, hard saddlebags with 21 gallons of total STORAGE. They’ll hold all the new Victory apparel a rider needs around town or on an overnight run. The bags have lockable lids with weatherproof seals, and the lids can easily be opened or closed with a single gloved hand. Like all Victory models, these Baggers provide outstanding RELIABILITY to minimize the cost of ownership. Instead of spending big bucks on oil changes or frequent maintenance, a Bagger rider can spend the bike budget on accessories, apparel and travel. The engine and transmission share 5 quarts of oil, so oil changes are simple: Drain, add a new filter, refill with oil and ride. There are no additional oil reservoirs to tend to. Plus, the recommended oil change interval is every 5,000 miles, which is a lot of riding between oil changes. Stay tuned for the introduction of the complete 2013 Victory lineup on July 30, 2012.